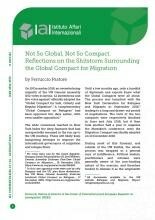 On 19 December 2018, an overwhelming majority of the UN General Assembly (152 votes in favour, 12 abstentions and five votes against) officially adopted the “Global Compact for Safe, Orderly and Regular Migration”. A complementary “Global Compact on Refugees” had been approved two days earlier, with even smaller opposition. The wide consensus reached in New York hides the deep fractures that had unexpectedly emerged in the run up to the UN meeting. These will likely keep hampering attempts to improve the international governance of migration and refugee flows.